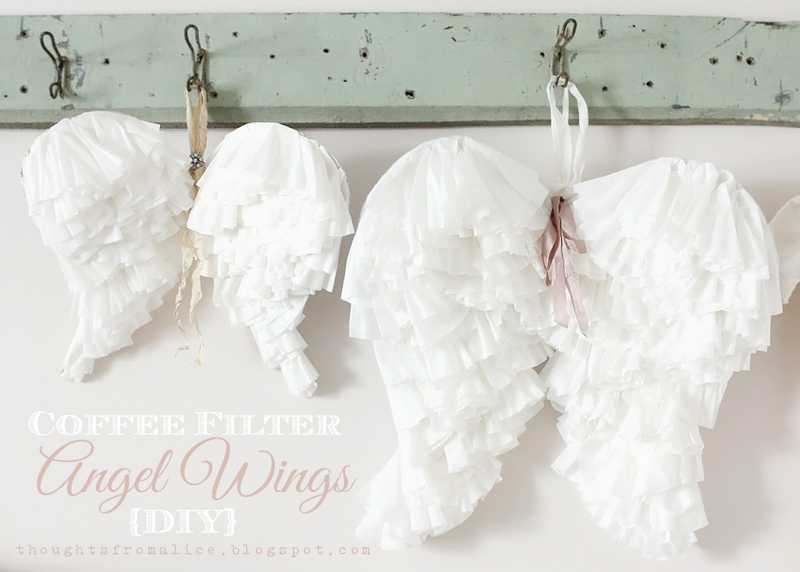 I had hoped to get a diy tutorial on these coffee filter angel wings posted awhile ago, but life with two little ones sure keeps me busy! 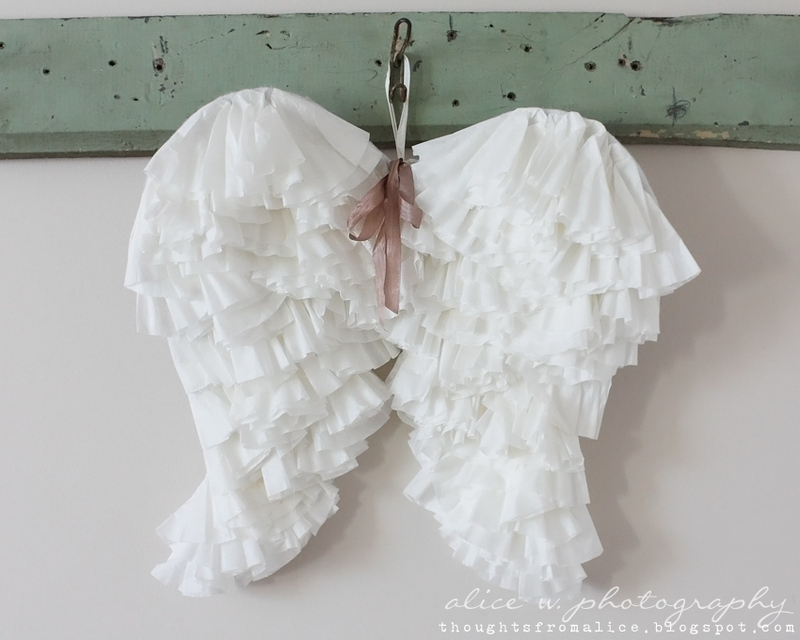 I received many requests for instructions on the large pair of angel wings that I made for my dining room Christmas mantel (see that post here). 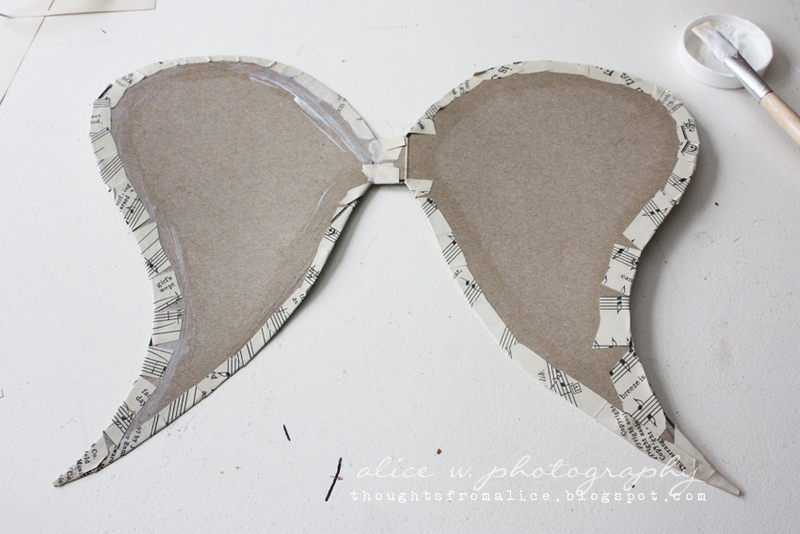 For this tutorial, I made a smaller pair and changed it up a little bit. I hope I can make it as “simple” as possible for you, but this project is a bit tedious and takes roughly an hour or so (uninterrupted that is – if you are lucky enough to have such time). 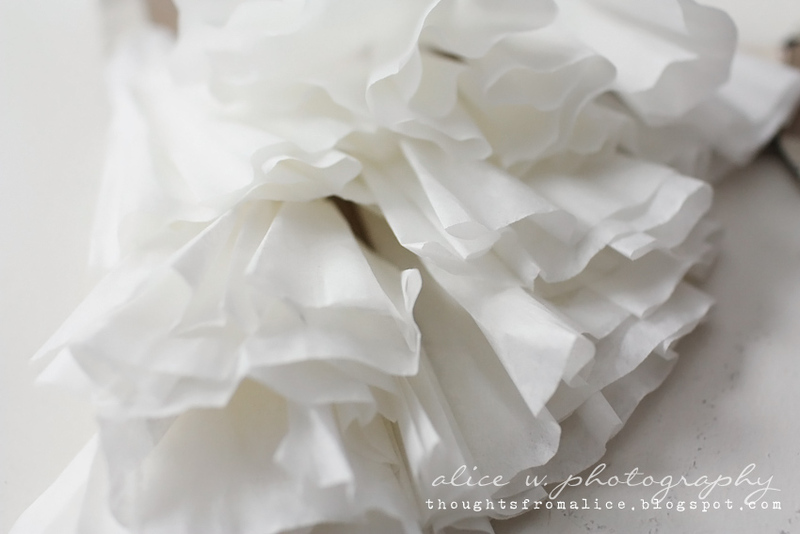 -several and I mean SEVERAL coffee filters . I used the ones on the bottom of the pack that were not tight and had a looser wave to them. 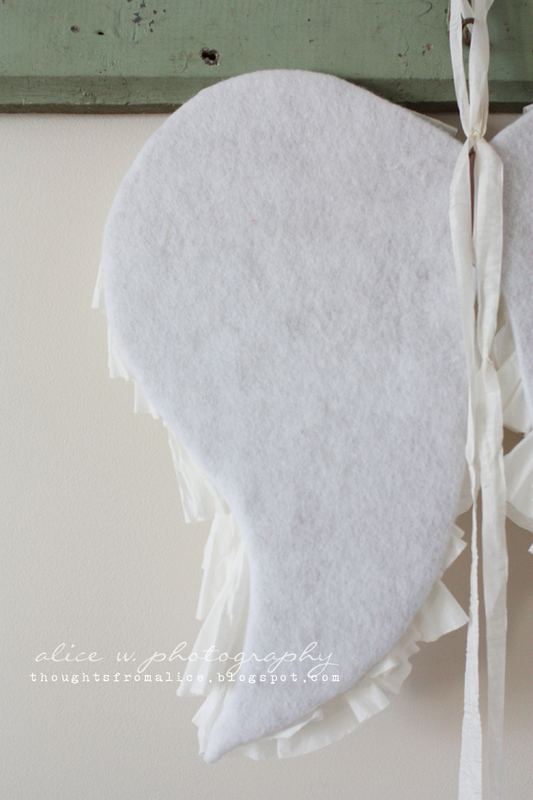 Again, this tutorial is for a smaller pair of angel wings. The larger pair requires bigger pieces of cardboard (I cut an empty diaper box we had on hand), a LOT more coffee filters, and I also lined the back of that one with white felt. 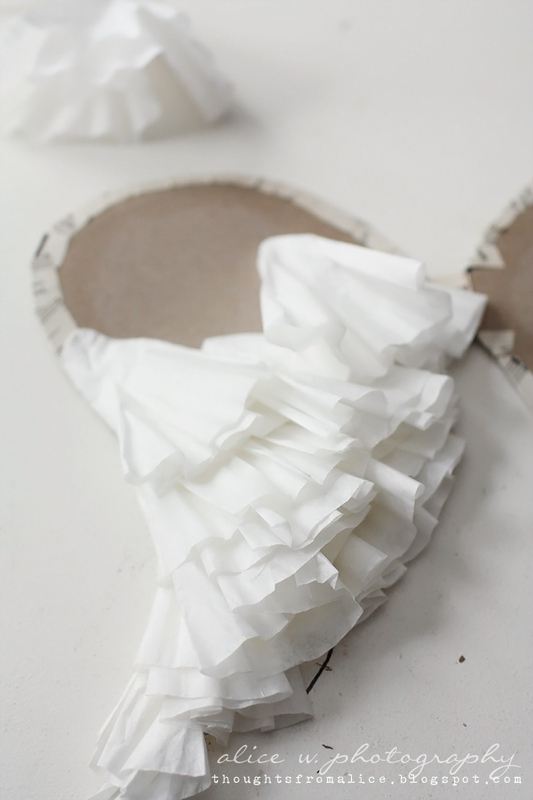 If you want to make a larger pair, you will need to adjust some of these instructions a bit. This one becomes the template for the other side after it is cut out. 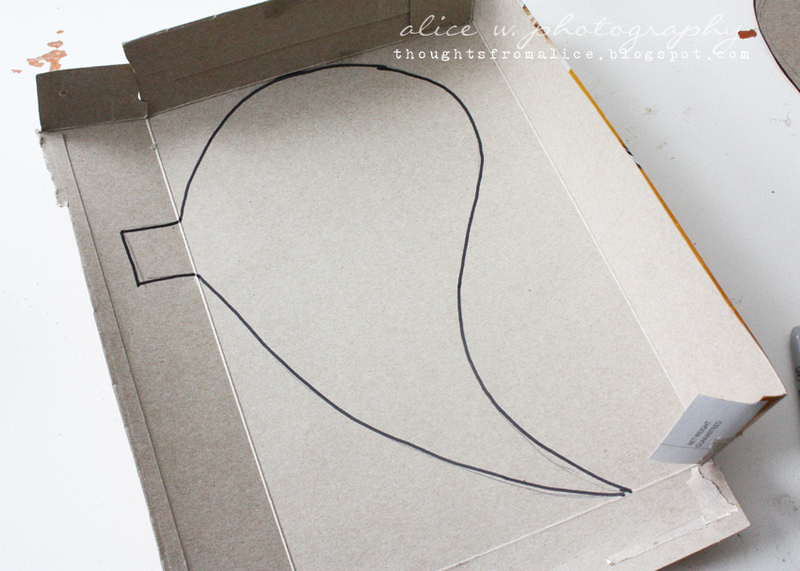 The difference, on the flip side, is to add a section of the middle where the box folds (approximately a 2″ square). 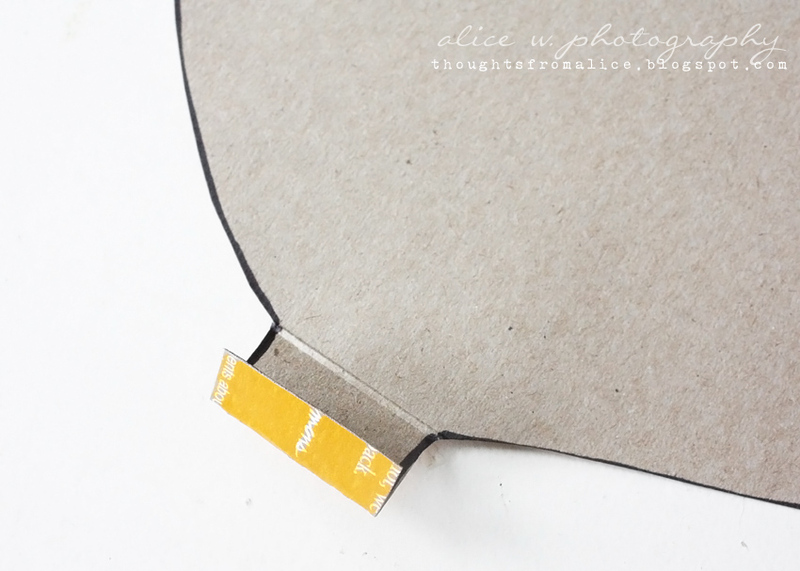 You could use one large piece of cardboard and skip this step if you preferred. 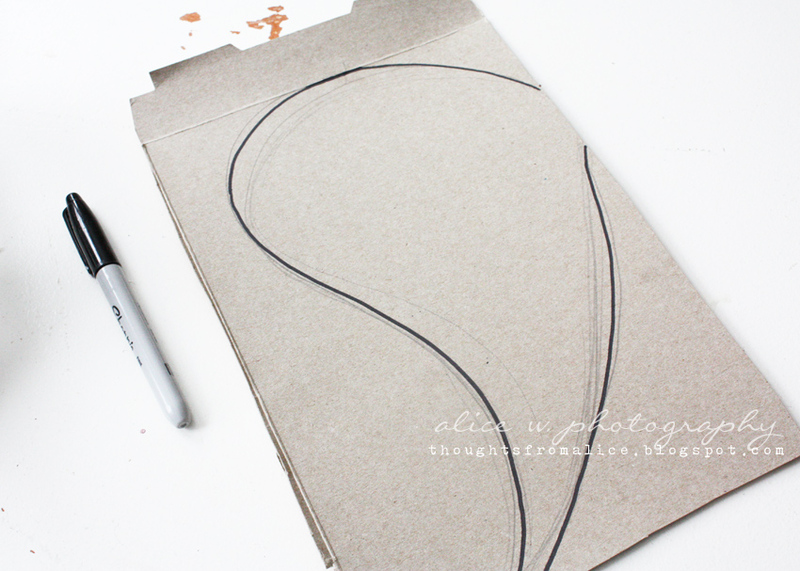 Just make a separate angel wing template to trace and leave a space about an inch across and two inches long between the two. If you use two pieces, the next step is to glue them together. Glue the left side on top of the flap. this makes it possible for the angel wings to bend inward on both sides a bit. 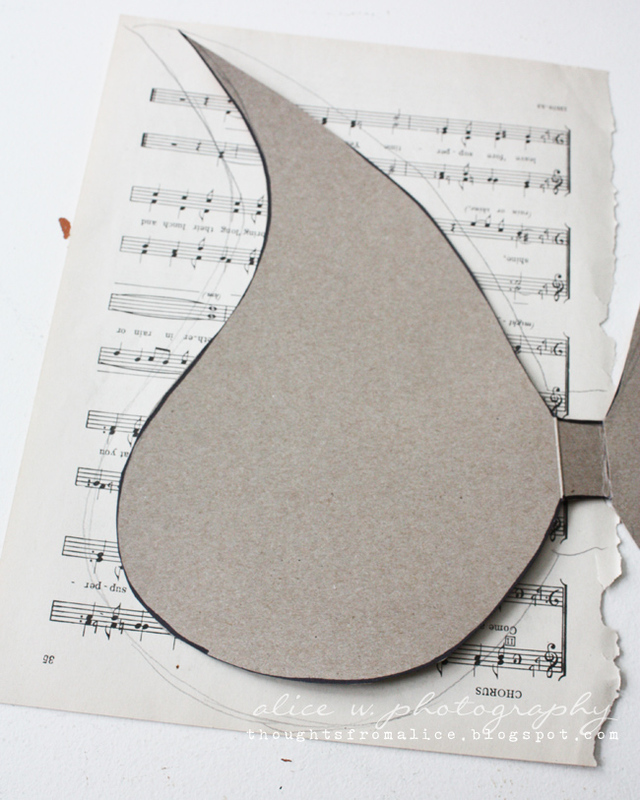 One way that I changed this pair up from the first, was by mod podging sheet music to the backside. 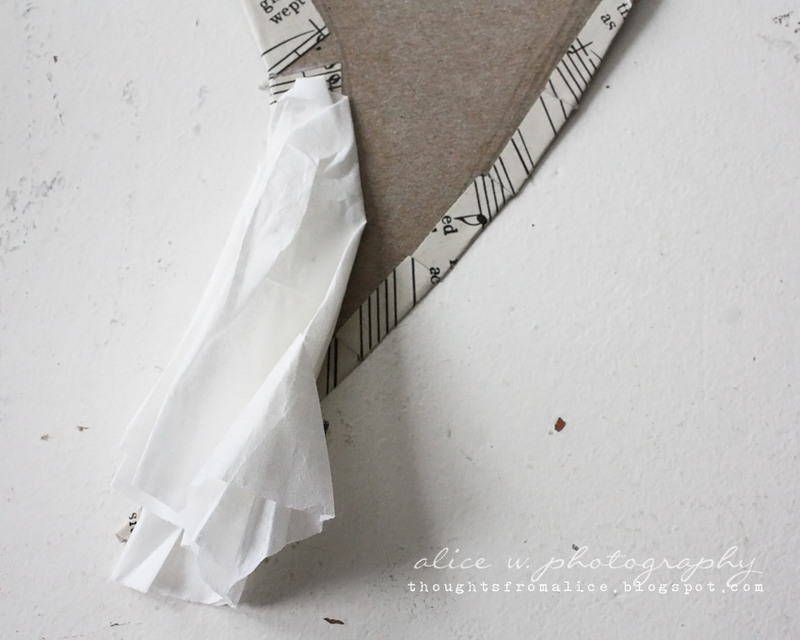 You could cover it in anything including fabric or felt like I used for the larger pair – just leave about a half inch seam allowance and glue. 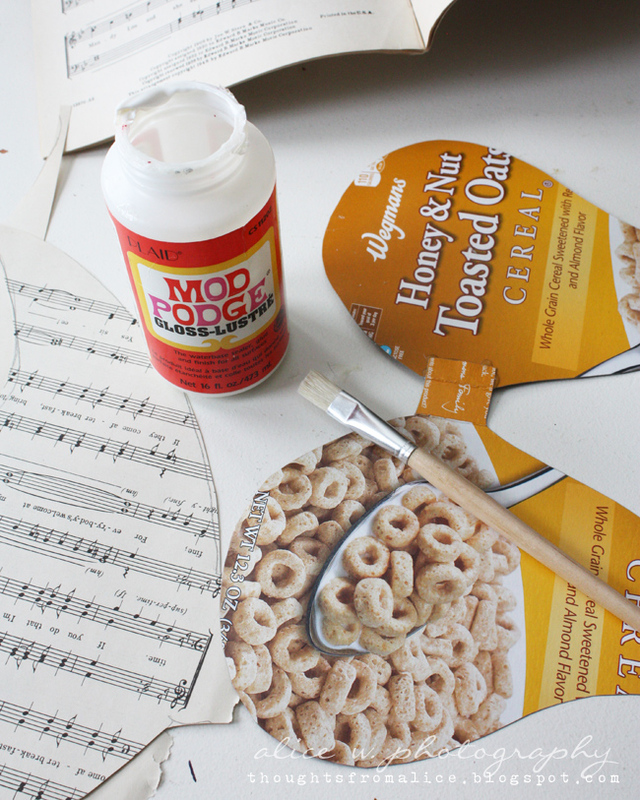 The sheet music was a little more work. 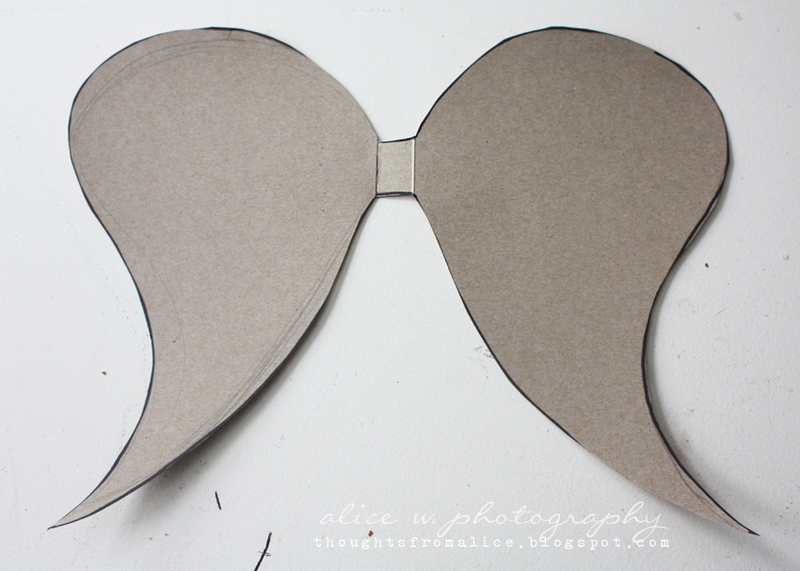 I traced the wings onto large pieces leaving about 1/2″ allowance around them. I cut slits to fold over and glue down on the back side. 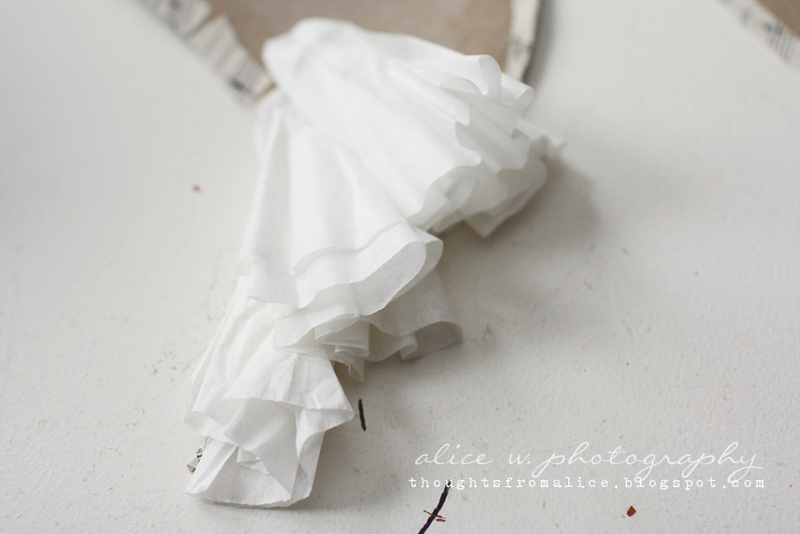 This part is a bit tedious (gluing the fabric was much faster). 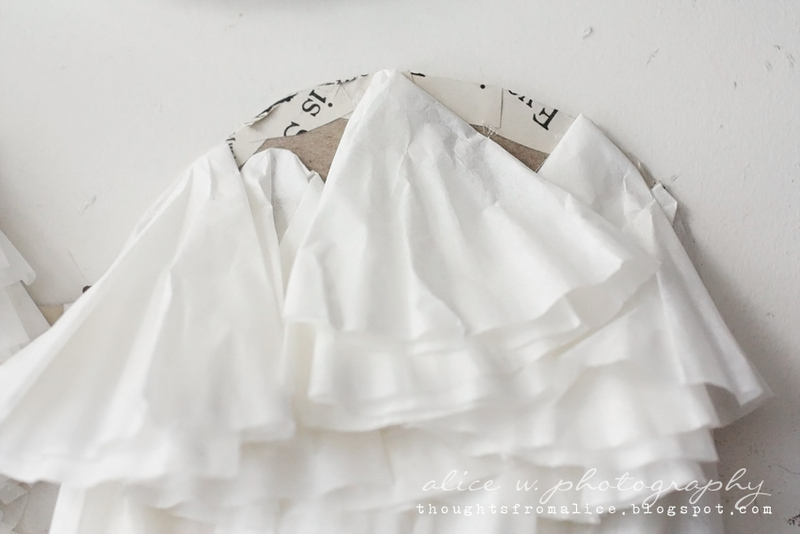 To make it go a little faster, start by lightly folding several coffee filters into tents with one layer shorter than the other. I would say the hardest parts for this project, are the bottom tip and the top curve. Getting them to “look right” is a lightly tricky and takes some extra folding and manipulating. 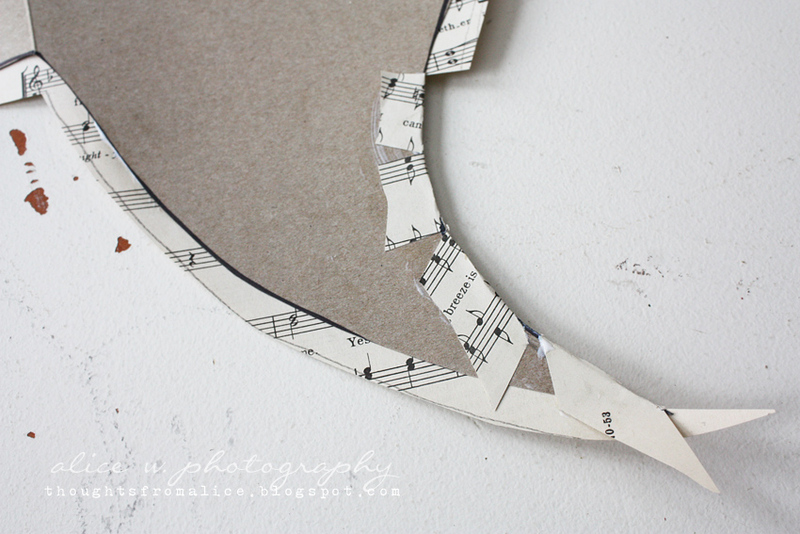 I started at the bottom and worked upwards gluing layers about an inch above each other so that they overlapped a lot. It gives the wings a more full look in the end. 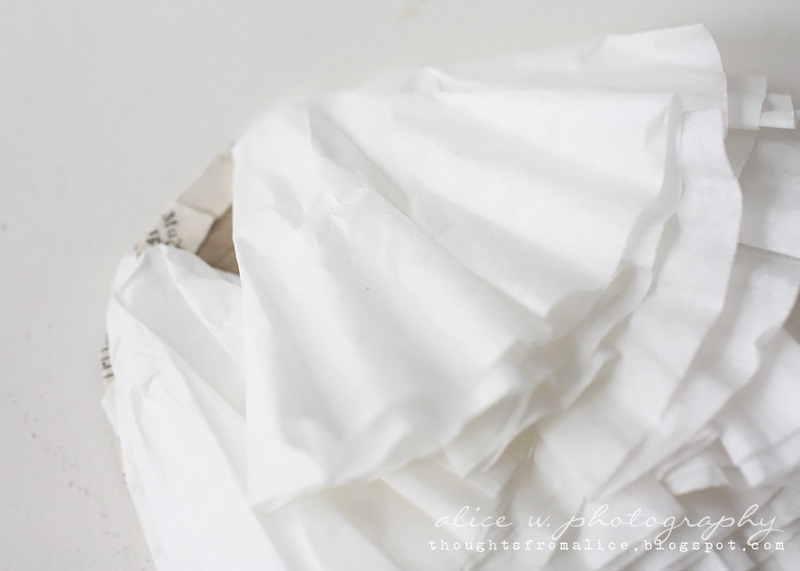 That is what makes this part tedious: not being stingy with the coffee filter layers – the more the better! 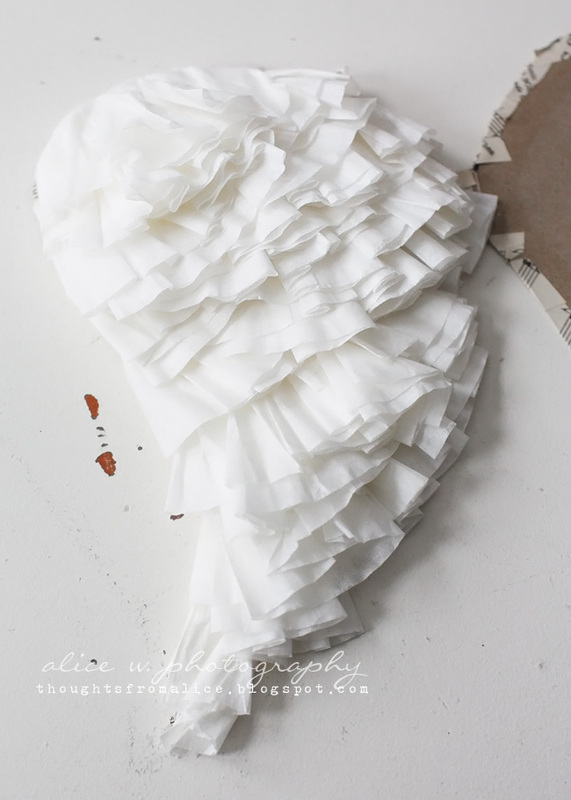 Fill in lots of coffee filter layers all in the same angle. 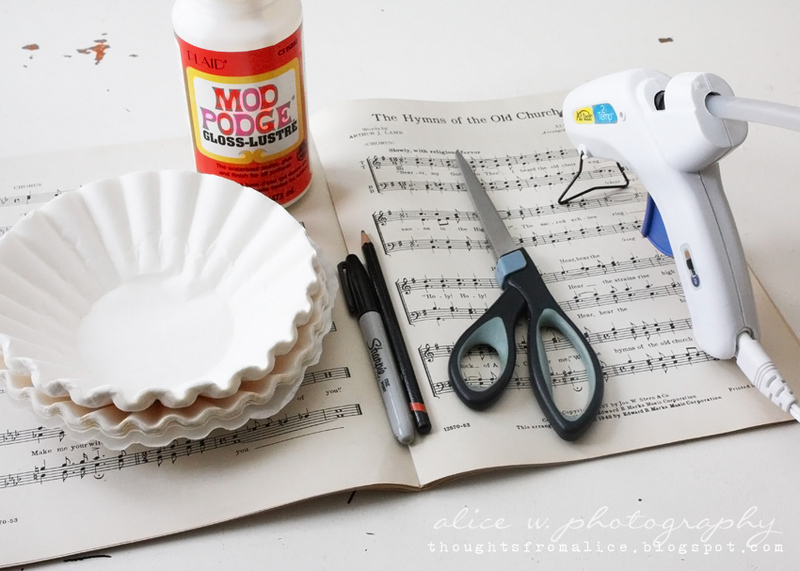 As you are adding more coffee filters you may notice areas with gaps. I added more in to make them very full. As you work towards the top it gets a bit harder. And I must warn you, when I made the large pair, I burned two of my fingers so badly! 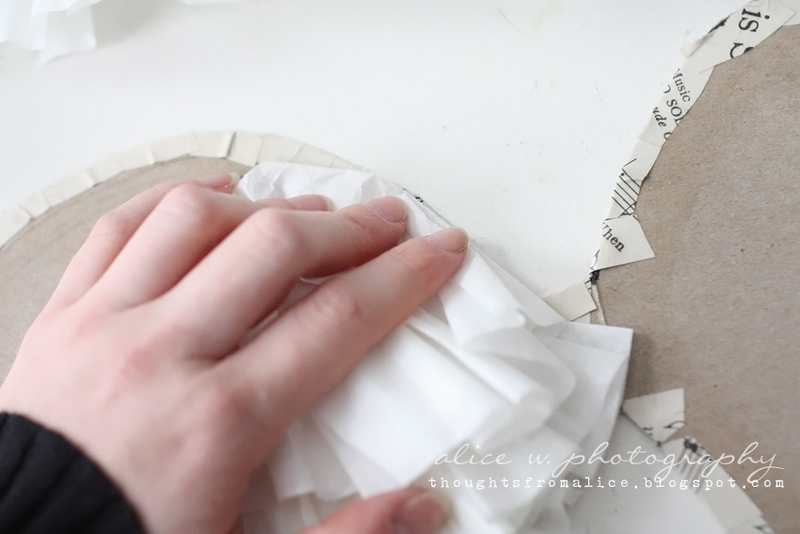 Use a lot of caution as you glue each coffee filter down so you don’t suffer the same (it hurt for days!). Since the top is the last layer and will be seen, I tried to fold them to line up with the edge as I glued them down. You will feel really good when you finish that first wing. Then you will remember you have to do the other one 🙂 That side seemed to go faster. 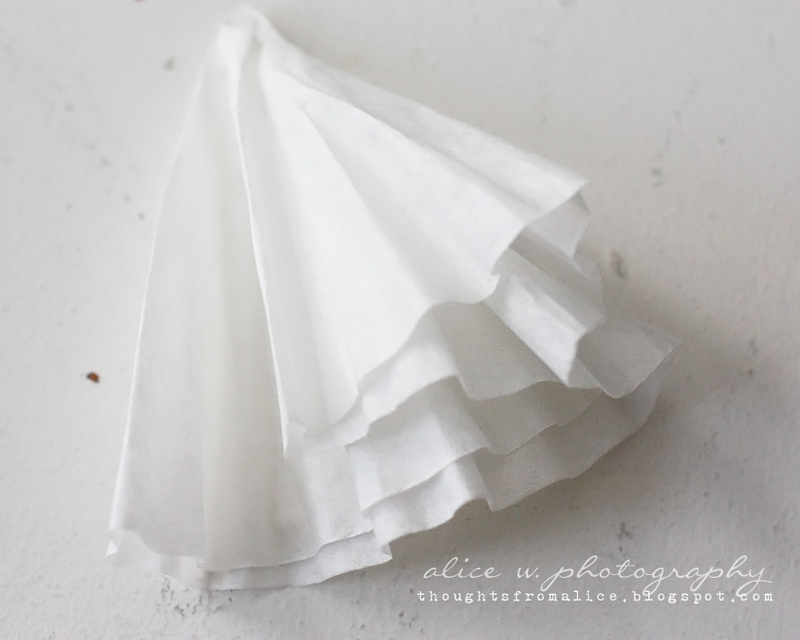 Just follow the same steps, but make sure to angle the coffee filters in the opposite direction. I tied a ribbon around the center piece into a bow (the two loops were used to hang it here). I also added a tiny vintage brooch so that this pair would coordinate with the lovely fabric pair of wings that I purchased from Dawn of The Feathered Nest. They are going to hang together in my daughter Hazel’s room. 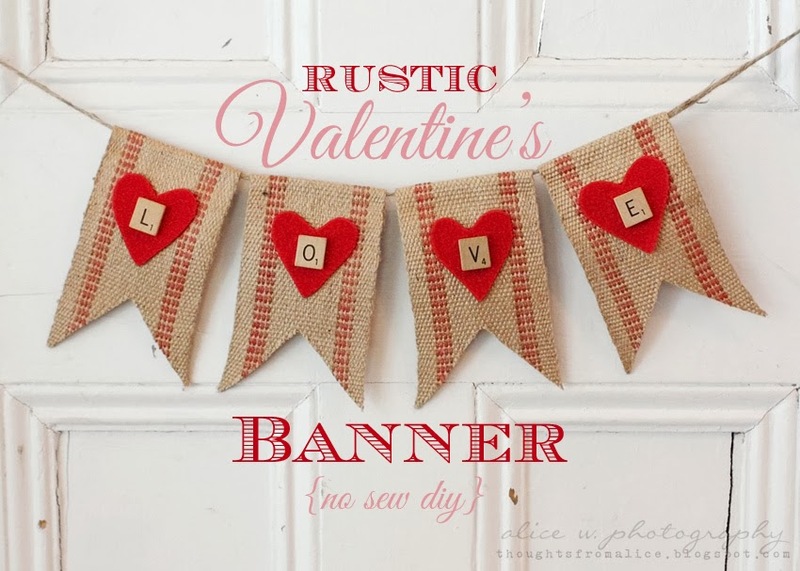 You could add any type of ribbon or twine depending on the look you are trying to achieve. 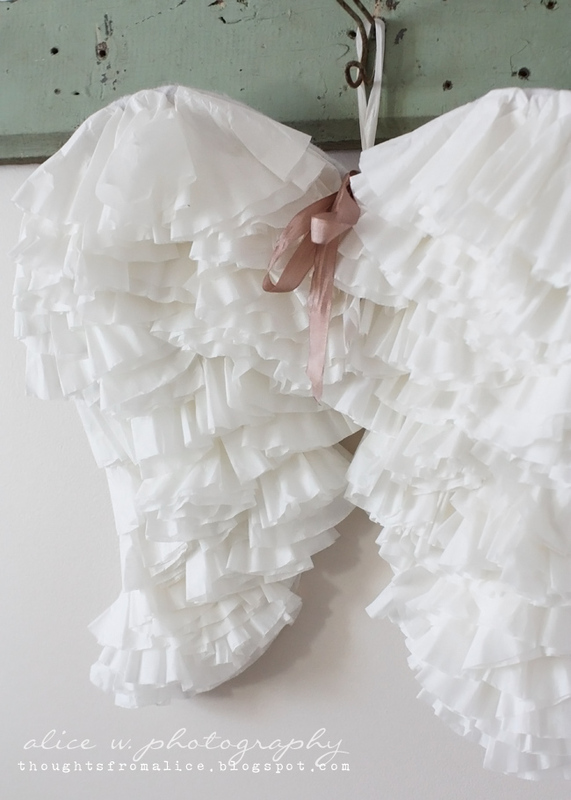 The large pair doesn’t have any embellishment except champagne colored seam binding. 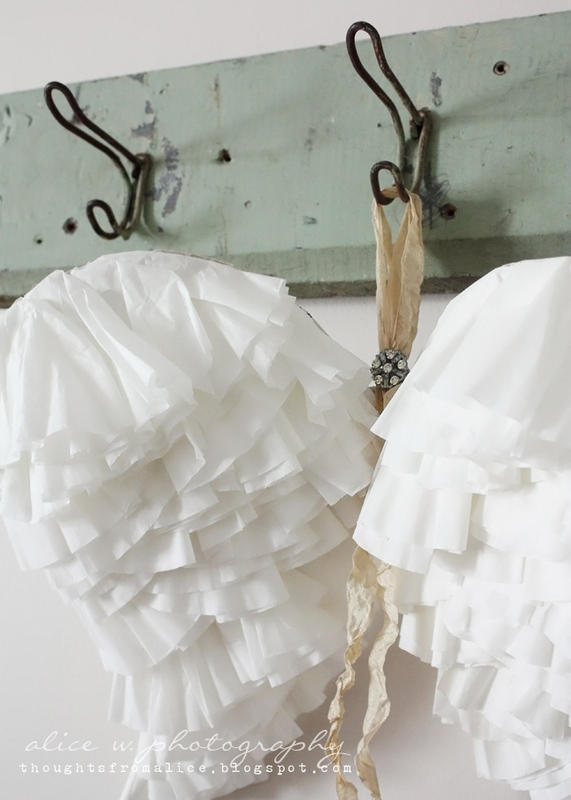 These would look lovely with dyed and/or tea stained coffee filters for a vintage look as well! I hope you enjoyed this tutorial and that you will check out more of my projects here! Wishing you a Valentine’s day filled with love! If you enjoyed this tutorial please share! If you enjoyed this post, please follow me by email so you never miss a post! You can also find me on Pinterest, Instagram and Facebook! *This post contains affiliate links. I may receive a small commission for any sales made through them. The cost to you does not change. 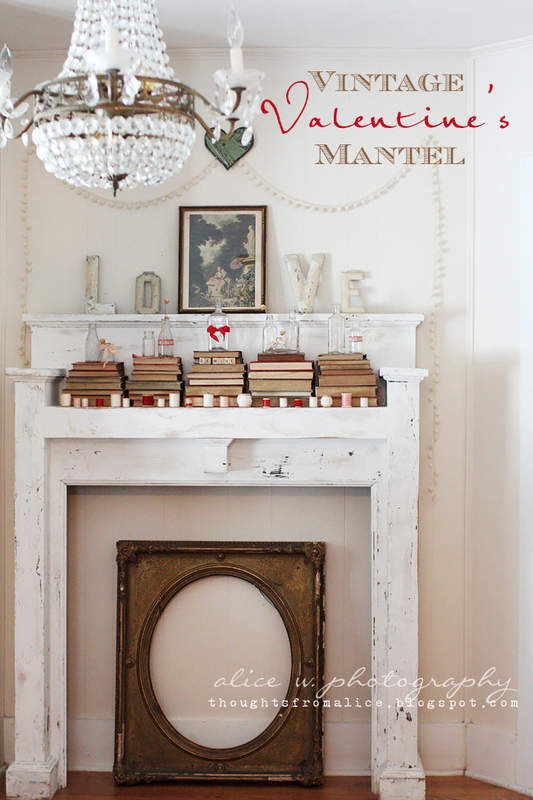 Top Ten Posts of 2013 & a Free New Year’s Printable! So pretty! I love how they turned out. Another gorgeous project ! love them. Beautiful wings, and wonderful project!! 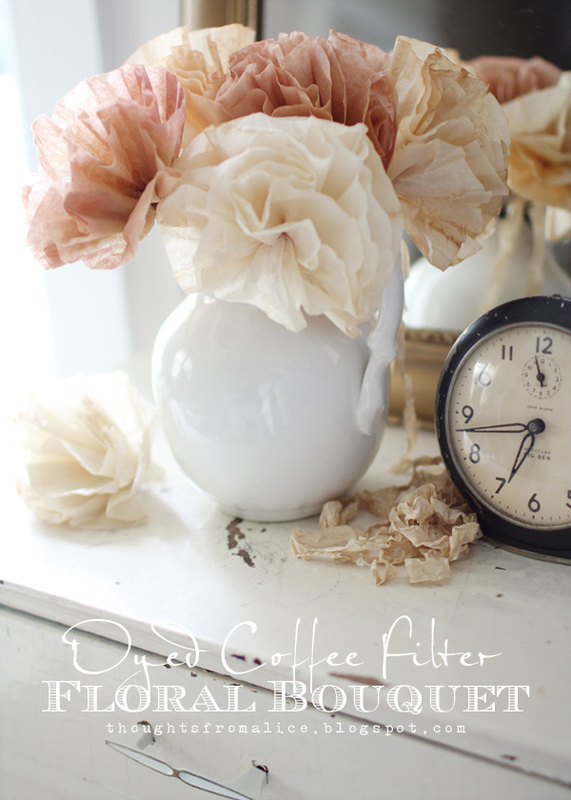 I have coffee filters that we don't even use cuz we're not coffee drinkers, but I'm getting some wild ideas with this. Thanks so much for sharing!! I am so glad you posted this particular DIY. Having the step by step visual helps tremendously. I love these, Alice! 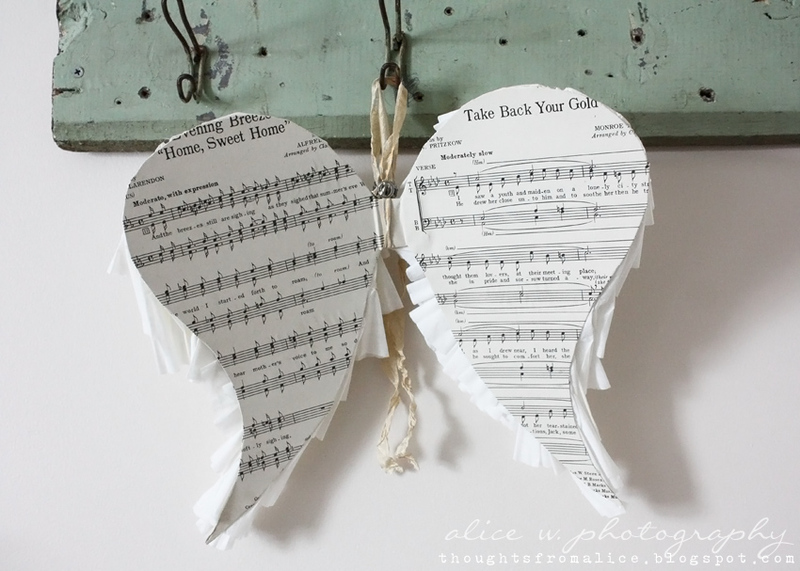 I love these thanks for sharing how to make them. I am going to give it a try. I am a new follower of your blog. Happy Valentine's Day. I'm sharing this with our music teacher! Happy to have visited & now following! Please stop by when you have a moment, I love company & new friends are always welcome! Love this! I feel so inspired now. 🙂 Pinned. OH I LOVE THESE! 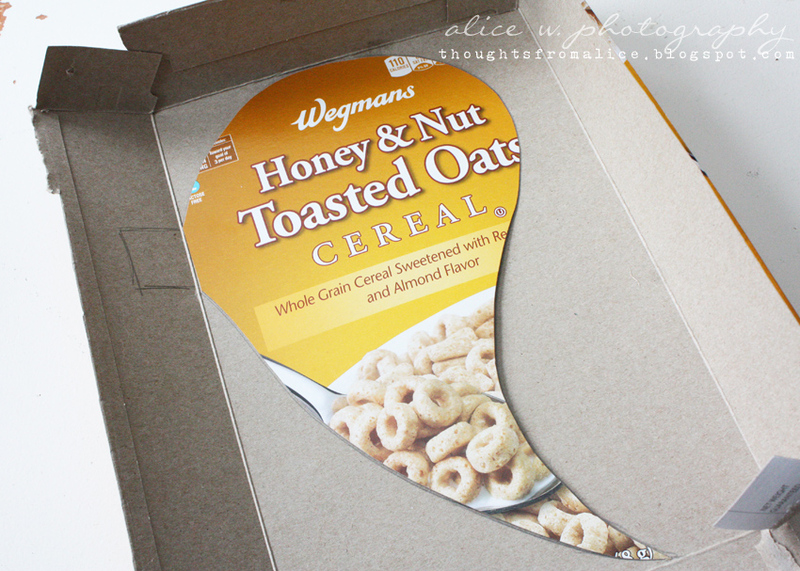 I ALSO WAS SO SURPRISED TO SEE THE WEGMAN'S CEREAL BOX!!! I AM FROM ROCHESTER, HOME OF WEGMAN'S !!!! I THOUGHT IT WAS JUST SO COOL TO SEE IT!!!! These are adorable! I'll be trying some for sure. What could I add that my daughter could wear them? These are genius! 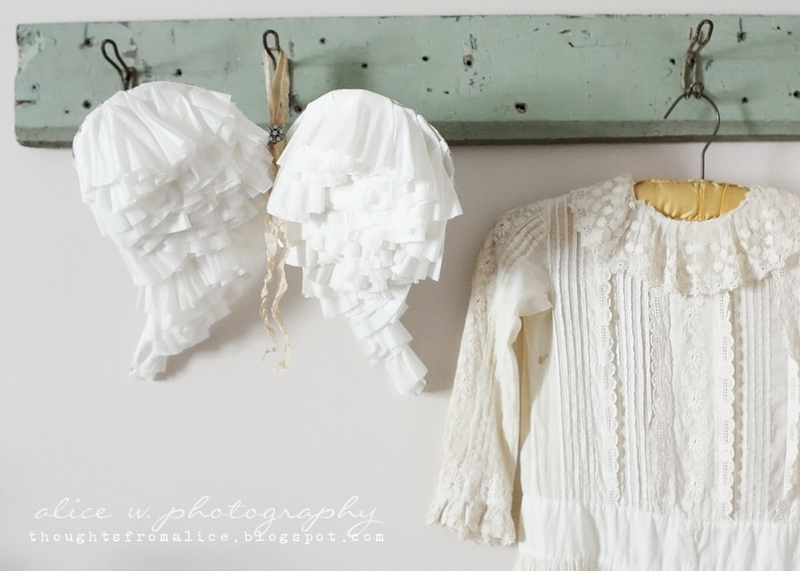 I love the use of such a different (and cost-effective) medium–I'll be making some grownup-sized for sure! These are so beautiful. I would like to tie dye or tea stain the filters first. I have shared this on my Magical Things Fairy Day Roundup post.